Dr. Eugenie Brunner discusses the positive and negative effects that could potentially occur following nasal surgery and touches upon the typical factors that determine the cost. 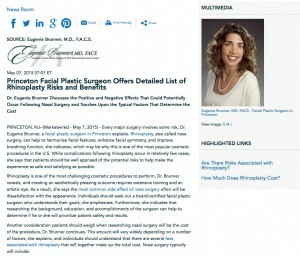 Princeton, NJ—Every major surgery involves some risk, Dr. Eugenie Brunner, a facial plastic surgeon in Princeton explains. Rhinoplasty, also called nose surgery, can help to harmonize facial features, enhance facial symmetry, and improve breathing function, she indicates, which may be why this is one of the most popular cosmetic procedures in the U.S. While complications following rhinoplasty occur in relatively few cases, she says that patients should be well apprised of the potential risks to help make the experience as safe and satisfying as possible. Rhinoplasty is one of the most challenging cosmetic procedures to perform, Dr. Brunner reveals, and creating an aesthetically pleasing outcome requires extensive training and an artistic eye. As a result, she says the most common side effect of nose surgery often will be dissatisfaction with the appearance. Individuals should seek out a board-certified facial plastic surgeon who understands their goals, she emphasizes. Furthermore, she indicates that researching the background, education, and accomplishments of the surgeon can help to determine if he or she will prioritize patient safety and results. Additionally, Brunner reports that the procedure’s level of complexity, the surgeon’s years of experience, and the geographic location of the practice can also contribute to the final cost. She urges individuals to specifically ask what the price includes when offered a quote. Ultimately, Dr. Brunner believes that rhinoplasty offers an abundance of benefits, particularly for patients who are self-conscious about their appearance due to nasal concerns or who have trouble breathing, but individuals should perform diligent research about the procedure and the chosen surgeon prior to undergoing the operation. Taking the time to find a board-certified facial plastic surgeon who makes the person feel comfortable, listened to, and safe typically will be essential for an optimal outcome, she concludes. Double board certified in facial plastic and reconstructive surgery and head and neck surgery (otolaryngology), Dr. Brunner has been practicing in the Princeton area since 1997. She is a two-time recipient of the Patients’ Choice Award and an active member of several prestigious medical associations. She received her undergraduate degree from Rutgers College and her medical degree from the Robert Wood Johnson Medical School—The University of Medicine and Dentistry of New Jersey, where she graduated with honors. She also has fine art experience, having attended Parsons School of Design in New York City. Dr. Brunner is available for interview upon request.